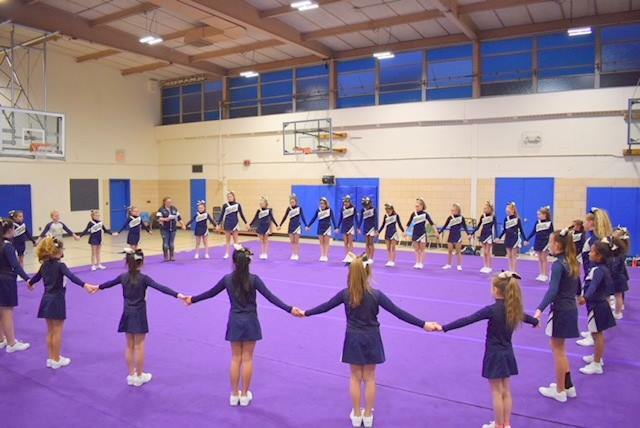 Congratulations to the A/B combined cheer team for receiving a spirit award in today's CTYFL Cheer Competition and to the D cheer team for participation in the cheer exhibition. 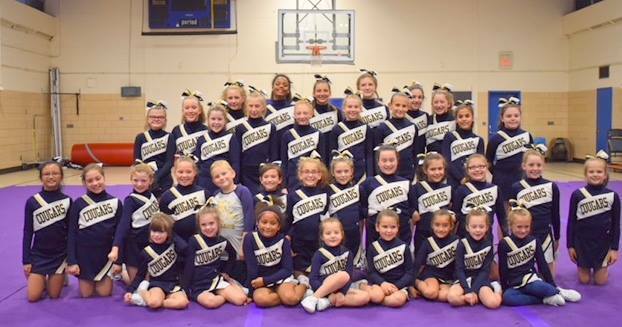 Breaking...C cheer team wins second place out of 8 teams in 2018 CTYFL Cheer Competition. Well done!!! B: HK 38, Cromwell 0 For video of the game, click HERE Thanks Mike Seward! For more details, click HERE. THanks Eric Anderson for all the amazing pictures! B: HK 50 , Berlin 20 See the video HERE Thanks Mike Seward! Click HERE or on the FACEBOOK button on the left for more pictures from Eric Anderson! 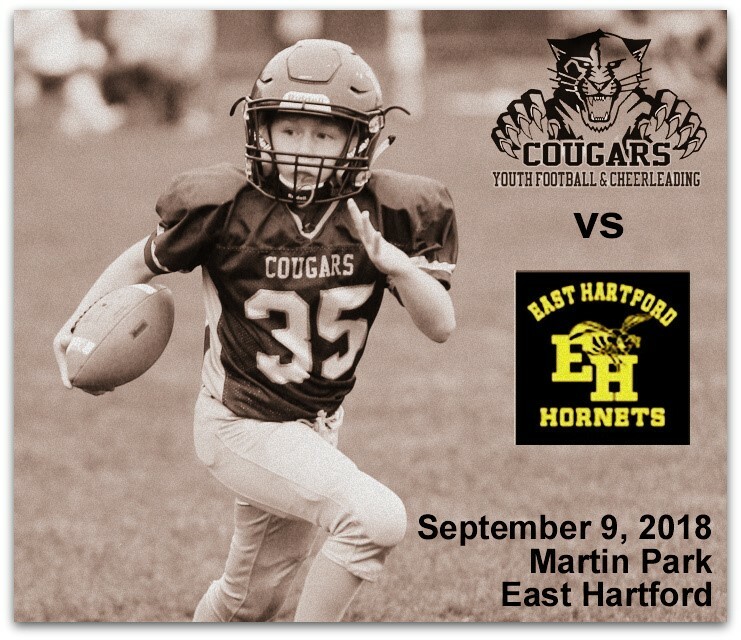 The Haddam Killingworth Youth Football and Cheer A, B and C sqauds hosted the Berlin Bears on Sunday at Eric Auer Field at KRP and were successful in all contests. 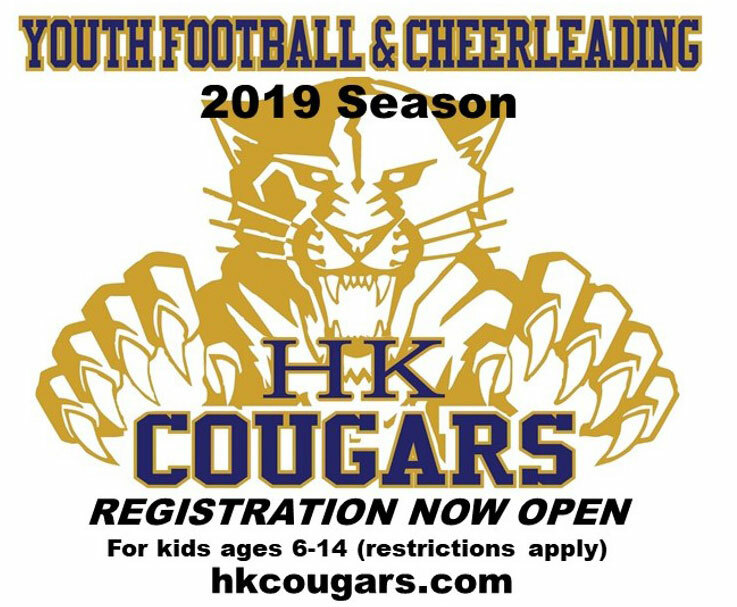 The HK squads will be preparing extra hard for the final 2 weeks of the regular season as teams across the league fight for a spot in post season play which begins on November 4th. The A squad won their third game in a row to improve to 4-2 on the season with a convincing 32-6 victory over the visiting Bears of Berlin. HK doubled its 16-0 halftime advantage in the second half and with relentless defensive pressure throttled any chance of a Berlin comeback. The Cougars scored maximum points on 4 possessions with their strong extra point kicking game. The defensive mark was set early as Lee and Cary Harwood stopped Berlin runners for no gain in their first 2 snaps and Orion Inkel blocked Berlin’s first punt. Tate Callender would recover a fumble and rush for 2 scores and Kevin Harrison had an interception to thwart Berlin’s only scoring chance of the half. HK received the ball first in the second half and mounted an 11 play drive that ended with quarterback Alex Phipps rushing in from the 1 yard line. Orion Inkel outran a Berlin defender and dove across the goal line after a 15 yard run to cap off HK’s second half scoring. HK allowed Berlin only 1 net yard of offense in their first 2 possessions of the second half while recording 3 tackles for a loss and a sack. Berlin scored a touchdown as time expired for the final margin of victory. Tackle leaders for the game included Nick Fox (5), Aiden Griswold (3), Lee Harwood (3), Carey Harwood (2), Inkel (2), Callender (2), Jacob Maier (1.5), Harrison (1), Caleb Dias (1), Jayden Fulton (1, 1 sack), Ben Cozean (1) and Bryce Anderson (0.5). Callender rushed for 77 yards with Inkel and Lee Harwood contributing 43 and 19 yards respectively. Cavin Napoletano was a perfect 4 for 4 on extra-point kicks for HK. 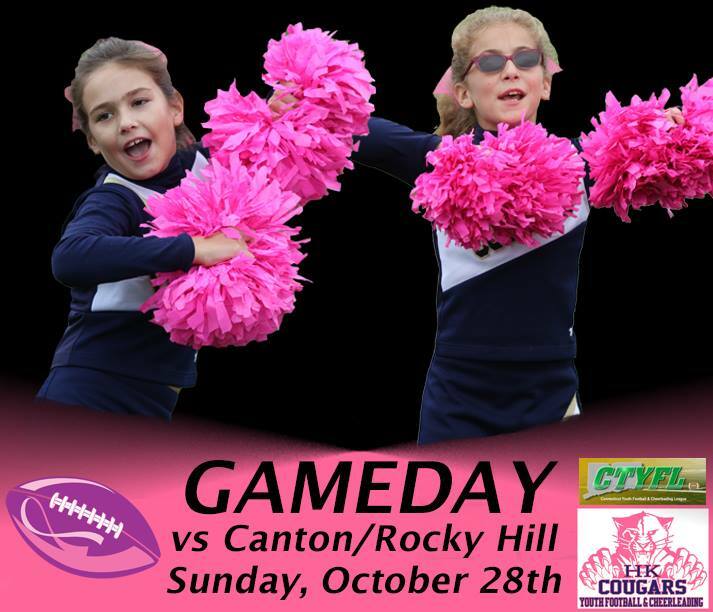 The Cougars travel to Cromwell on Sunday to take on the Lions (4-1). In the first game of the day the HK B squad beat Berlin by a score of 50-20 to remain undefeated at 6-0 on the season. 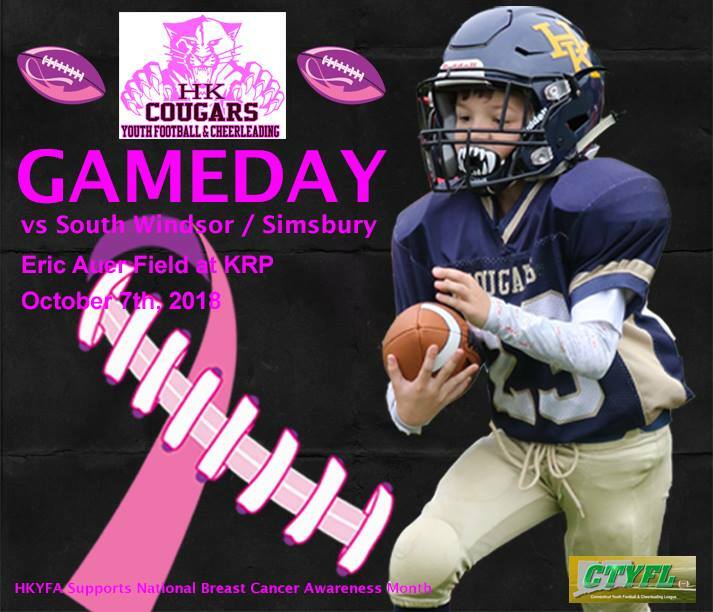 The Cougars are one of only 2 undefeated teams in the CTYFL B division and will travel to Cromwell to play the Lions (3-3) on Sunday. The HK Cougars hosted the Berlin Bears in a match-up for the ages. Coming into the game, both teams sported identical 4-1 records, with both having fallen to the same opponent (East Hartford Hornets). The game did not disappoint as both squads played hard and executed well - 80+ plays with no turnovers and only 5 penalties. The game started with the Cougars taking possession near midfield and earning two quick first downs on runs from Josiah Bourne, Josh Frith and Axel Kolcio. The team opened up the scoring on a 29-yard completion from Owen Jones to Axel Kolcio, capped off by a successful PAT, again Jones throwing to Kolcio. After a long kickoff return to the Cougar 25-yard line, the H-K defense was stout - returning the ball to the offense 4 plays later. The Cougar offense collected two more first downs before stalling and punting back to the Bears. Three plays later (after great tackles from Jake McGrath and Lucas Norko and a pass break-up from Garrett Whitmer and Owen Jones), the Cougars took possession on their 31-yard line. Josiah Bourne again powered through for solid gains while Axel Kolcio had a long run negated by a holding penalty. Bourne converted a 4th-and-1 at midfield and Tyler Napierkowski took some carries to move the ball deeper into Bear territory. Bourne broke free for a 20-yard gain, John Moyher added a carry and Jones connected with Bourne on a pass to bring the ball to the 2 yard line. Moyher plunged in behind great blocks from Kyle House and Eli Hamman-Shay and the Cougars took a 13-0 lead into halftime. Undeterred, Berlin took possession in the second half and advanced the ball 39 yards on 11 plays before stalling on the Cougar 20. The HK offense returned the favor by running 11 plays and moving the ball back into Bear territory. An unsuccessful 4th down play gave the Bears the ball back on their own 38 yard line. 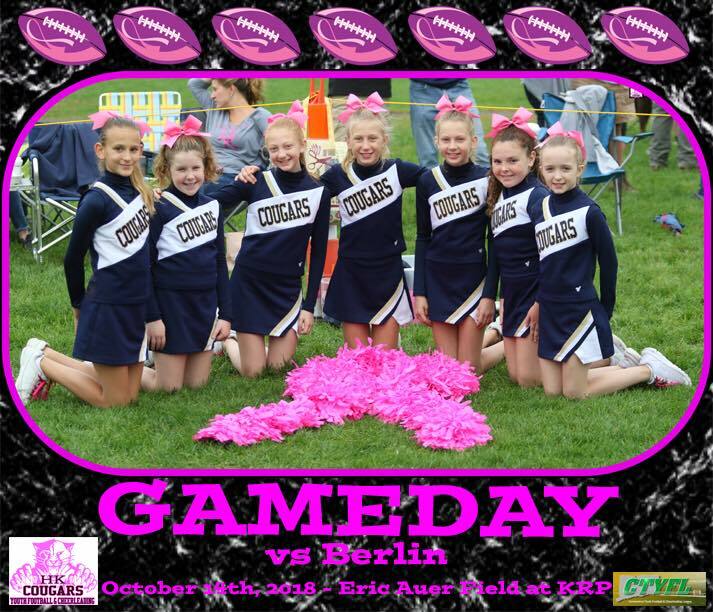 The resilient Berlin team reeled off a 12-play drive, capped off by a 4th-and-8 touchdown pass from the Cougar 15 yard line. After a successful PAT, the Bears attempted an onside kick with 1:49 to play. A big time play from Tyler Napierkowski thwarted the Berlin attempt to regain possession. However, the Cougars came up just short on 4th down and returned the ball to the Bears on the Berlin 46 yard line with 0:20 left in the game. With three "nailbiter" pass defense plays, the Cougars sealed the victory and moved to 5-1 on the season. The offense was paced by an outstanding effort from Josiah Bourne (21 carries, 99 yards; 1 reception, 8 yards). The defense had many outstanding contributions - many from Josh Frith, Garrett Whitmer, Owen Jones, Josiah Bourne and Jake McGrath. The Cougars collected 193 yards on 44 plays and earned 11 first downs and the Bears tallied 108 yards on 36 plays and earned 6 first downs. 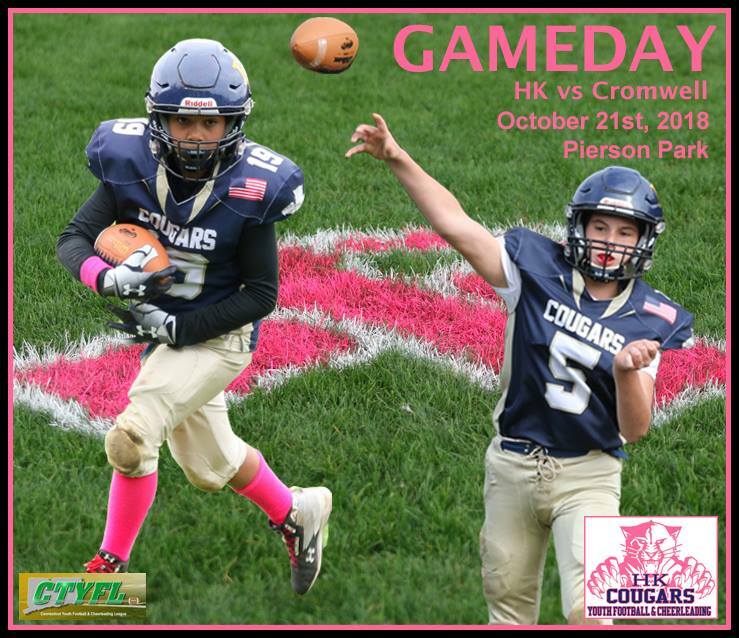 Next week, the Cougars travel to Cromwell to play the undefeated, defending champion Lions - - - please come out and support the boys! The Cougar D squad had a bye this week and will play Cromwell (5-0) in week 7. 10-7-18 Simsbury/South Windsor Game results! B: HK 32, South Windsor 0. 5-0 season Click HERE for the video. Thanks Mike Seward! Check out the pictures link on the left or HERE for the facebook page and details on each game. Thanks Eric Anderson for capturing all the kids! Click on the "Pictures" link on the left for pictures from all 4 games and here to see them on Facebook! Thanks Eric Anderson for capturing all these moments! In week 4 the A, B and C squads traveled to Bloomfield while the D squad traveled to New Hartford for a match up with the Wolverines. Looking to improve on a 1-2 start to the season with losses to East Hartford and Wethersfield by only 5 and 6 points respectively, the Cougar A squad arrived at Bloomfield looking to maintain aggressive defensive play and capitalize on offensive potential. The Cougars did not disappoint in either category, outscoring the Raiders 28-6 on a very warm last day of September to even their record at 2-2. Kevin Harrison had an outstanding first half of play, setting up the HK offense inside the 2 yard line on separate series with catches of 18 and 12 yards. Quarterback Alex Phipps finished off both scoring drives with runs up the middle to give the Cougars an early 12-0 lead. Just before half, Phipps connected with Bryce Anderson for a 22 yard strike for a first down and 2 plays later Harrison would add to the HK lead with a score of his own, a 7 yard pass from Phipps in the end zone. Cavin Napoletano finished off the first half scoring with an extra point kick and the Cougars took a 20-0 lead into the half. The Cougar defense held the Raiders to 29 total yards in the first half, all on the ground, with stout play on the defensive line and penetrating defensive pressure from Lee and Cary Harwood and Jayden Fulton who all recorded tackles for losses. Jacob Maier recorded an interception on the Raiders only passing attempt of the first half and Tate Callender and Lee Harwood led the 1st half ground attack with 29 and 27 yards respectively. In the second half, the Cougars ramped up the defensive pressure with Fulton and Lee Harwood teaming up for a sack and Fulton and Orion Inkel teaming up for a tackle for a loss. Vincent Scileppi and Connor Schipritt brought Bloomfield’s first 2 possessions of the 2nd half to a close with fumble recoveries and Jacob Maier forced a Raider fumble that tumbled out of bounds. HK’s only scoring of the second half was a 20 yard pass play to Bryce Anderson, who elevated for the reception and then broke away from his defender for the score. Napoletano kicked the extra point and Bloomfield would score a touchdown as time expired for a final tally of 28-6. The win was a true team effort and the defense, who played spirited ball all day, deserves a shout out. Recording tackles on the day were Callender (4.5), Lee Harwood (4), Fulton (3), Ali Chater (3), Scileppi (2.5), Carey Harwood (2.5), Inkel (2), Nick Fox (2), Maier (1), Harrison (1), Ryan Wiese (0.5) and Kevin Gamache (0.5). The offensive line play of Colin and Aiden Griswold, Anthony Maio, Jason Maziarz and Alden Weston allowed the HK runners extra space and Alex Phipps extra time to post a 6 for 11 passing day for 89 yards and 2 touchdowns. The B squad remains undefeated on the season at 4-0 with a 30-12 win over a Bloomfield team that had not given up a score this season prior to the matchup with HK. Michael Seward led the HK offense with 3 touchdowns (2 rushing, 1 receiving – pass from Cooper Savoy) and 3 extra-point kicks and Noah Conlan added a touchdown. The Cougars defense forced 3 Raider fumbles (Seward 2, Conlon 1) and Conlon had 4 sacks and led the team in tackles. Savoy recovered 2 fumbles and Gunnar Howes had 3 tackles for a loss. Hunter Roth recovered an onside kick by Wyatt Solosky. The team faces South Windsor (0-3) at home on Sunday. From opening kickoff to final whistle, the boys played good, hard team football. The hosting Raiders kicked off to begin the game and Axel Kolcio picked up the bouncing kick, moved left to the far sideline and ran the ball all the way to the end zone to start the game nicely for the Cougars. Josiah Bourne took an inside hand-off for the PAT and the Cougars were quickly ahead 7-0. The Raiders' offense took the field at the H-K 41 yard line, made a first down, but, then their drive stalled, returning the ball to the Cougars on their own 30. The team reeled off a time consuming 11-play, 70-yard touchdown drive, ending in a 6-yard TD toss to Garrett Whitmer from Owen Jones. The PAT was successful on a throw from Jones to John Moyher and the Cougars extended to 14-0. H-K's defense stopped the Raiders on a 3-and-out, returning the ball to the offense on their own 43. After a false start penalty and three solid runs from Tyler Napierkowski, Josiah Bourne and Josh Frith, the Cougars faced a 4th-and 2. Jones connected with Moyher again for a big 38 yard gain, moving the ball to the Raider 11. Axel Kolcio scored on the next play on a pass from Owen Jones; Josh Frith with the PAT run and the Cougars took a 21-0 lead into halftime. The second half featured more terrific play from the Cougar defense. The front line of Josiah Bourne, Jake McGrath, Eli Hamman-Shay, Kyle House, Stephen Bonczek, Nate Mulhall, and John Moyher made life difficult for the Raider offensive line. Linebackers Jack O'Brien, Garrett Whitmer and Josh Frith were also outstanding. H-K limited Bloomfield to 24 yards on 20 snaps and only two first downs. The Cougar offense in the second half was led by QB Lucas Norko who engineered a 10-play 78-yard drive, culminating in a TD run from Tyler Napierkowski. Tim Hickman ran in the PAT to finish the scoring for the Cougars. With the offense gaining 149 yards rushing and 59 yards passing, clearly the offensive line played outstanding football. Nate Mulhall, Noah Soucie, Kyle House, Jack O'Brien and Eli Hamman-Shay were terrific in getting their jobs done. Scores from week 3 today at KRP. B: HK 26, Wethersfield 14 Click here for B squad video. Thanks Mike Seward! HKYFA hosted the Wethersfield Eagles for A, B and C squad games and Cromwell traveled to KRP to take on the Cougar D squad in the afternoon finale. A special thanks to all of our game day volunteers who helped with field setup and take down, concessions, game announcing and apparel sales. In A squad action the Cougars lost to Wethersfield by a score of 22-16. Wethersfield scored a touchdown and extra point kick on their first series of the game but the Cougars would strike back late in the second quarter when Alex Phipps executed the quarterback sneak and Cavin Napoletano connected on the extra point kick. Wethersfield scored on a long pass play with seconds left in the half to take the 16-8 lead at the break. HK held Wethersfield to only 39 yards rushing in the first half on solid run and red zone defense but gave up over 100 yards passing including two for touchdowns. In the second half the Cougar defense again held the Eagle ground game in check but a long pass play for a touchdown (Carey Harwood blocked the extra point kick) would extend the Wethersfield lead to 22-8. The Cougars would mount a furious comeback with another Phipps sneak into the end zone and Napoletano kick to close the gap to 22-16. HK would force a turnover on downs in the Eagle side of the field with under 1 minute in the game and Tate Callender would garner a pair of first downs to bring the Cougars into scoring range but time expired on HK’s last attempt to score the equalizer. Callender (102 yards rushing), Kevin Harrison (44 yds rec) and Bryce Anderson (43 yds rec) helped led the offense and Orion Inkel had a 30 yard punt return. Quarterbacks Phipps and Lelko combined for 100 yards passing. The defense was led by Callender (4 tackles), Jayden Fulton (4 tackles, 1 TFL), Carey Harwood (3 tackles, 2 TFL, 1 sack), Orion Inkel (2 tackles, 1 TFL, 1 forced fumble and recovery), Bryce Anderson (2 tackles) and Napoletano (2 tackles). The Cougars (1-2) will face Bloomfield (1-2) next Sunday on the road. The HK B squad improved to a perfect 3-0 on the season with a 26-14 win over Wethersfield. 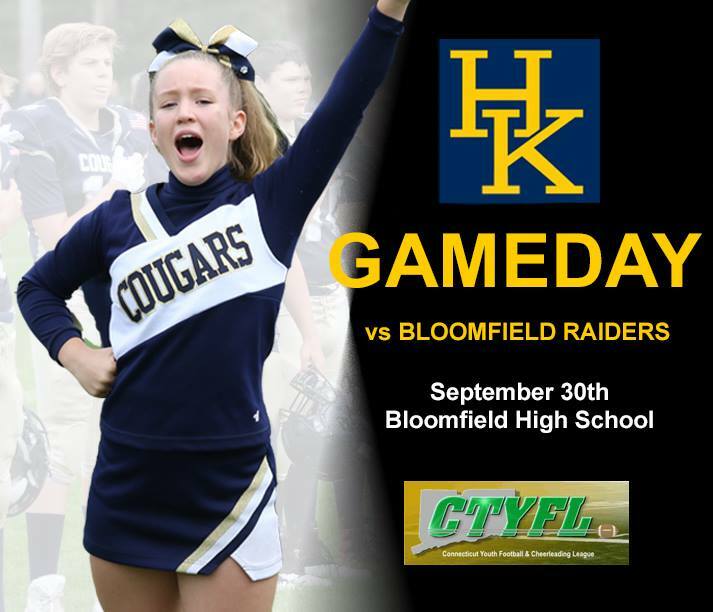 This sets up a showdown of unbeaten teams as the Cougars travel to Bloomfield (3-0) on Sunday. The Bloomfield defense has not given up a point this season. Cougars C-Squad Wins Home Opener 19-6. 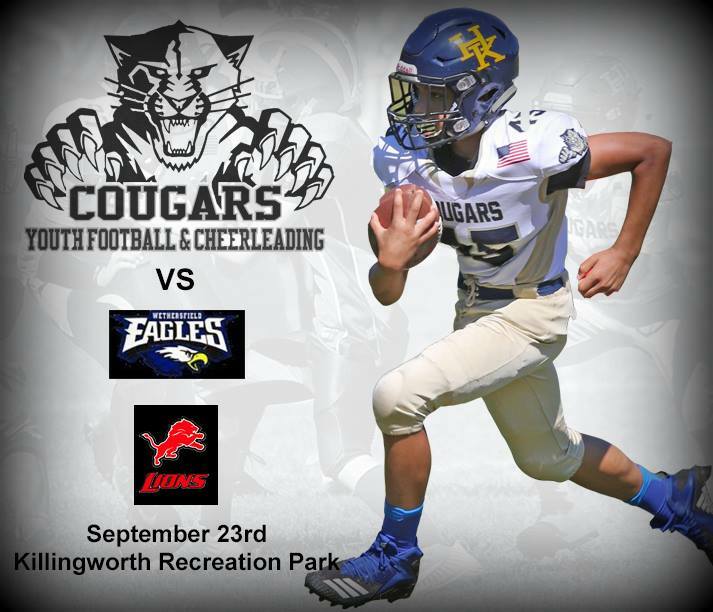 On the first Sunday of autumn, the HK Cougars C-Squad hosted the Wethersfield Eagles. The weather was perfect and the boys for both teams played an outstanding game. The Cougars defense set the tone early by forcing a 3-and-out on the Eagles' first possession. With the ball in hand, the Cougar offense executed a 6-play, 65-yard touchdown drive, capped off by a 42-yard TD pass from Owen Jones to Axel Kolcio. After forcing another quick punt from Wethersfield the Cougar offense earned a first down, but then turned the ball over as Jones was stripped attempting a pass to WR Alex Karber. The Eagles took advantage of this turnover, scoring on a 47-yard run on their second snap to tie the game at 6-6. HK then marched a 5-play TD drive with Josh Frith scoring on a 49-yard TD run. At halftime, the Cougars held a 12-6 lead. In the 2nd half, the Cougars started the action with a great kickoff return from Tyler Napierkowski, allowing the offense to start on the Eagles' 35 yard line. H-K earned a first down after runs from Josiah Bourne and Josh Frith, however, the Cougars committed penalties on the next two plays, creating a 1st-and-30 from the Wethersfield 43 yard line. Again, two hard runs from Bourne and Frith and the Cougars had 1st-and-goal from the 6. The Eagles defense stood firm, only allowing 4 yards on the next 3 snaps and the Cougars faced 4th-and goal from the 2. Fantastic blocks from Jake McGrath, Eli Hamman-Shay and Josh Frith, along with hard, downhill running from Josiah Bourne allowed the Cougars to earn their 3rd TD on the day. A pass from Jones-to-Frith for the PAT made the score 19-6. The Cougar's defense quickly returned the ball to the offense by recovering an Eagle fumble. The offense drove for 10 plays down to the Eagle 25-yard line, before failing to convert on 4th-and-6. The Eagles then mounted an impressive 15-play, 48-yard drive, converting on 4th down twice before returning the ball to the Cougars on the HK 22. With the final score of 19-6, the Cougars move to 2-1 on the season. For the 3rd week, H-K outgained their opponent - 286 yards to 100 yards. On the defensive side of the ball, Cougar standouts were Garrett Whitmer, John Moyher, Jake McGrath and Jack O'Brien. The offense was powered by a tremendous effort by the offensive line: Noah Soucie, Kyle House, Eli Hamman-Shay, Jake McGrath, Evan Vincent, Jack O'Brien and Nathan Mulhall. Ball carriers were Josiah Bourne (14-98, TD; 1 reception for 6 yards), Josh Frith (11-129, TD, PAT) and Axel Kolcio (4-11; 1 reception for 42 yards, TD). QB Owen Jones was 3-6 for 48 yards, TD, PAT. Next week the Cougars travel to Bloomfield (2-1). Please come out and support the boys! The D squad hosted the undefeated Cromwell Lions and fell by a final score of 38-7. Andrew Soucie scored the lone touchdown for HK as he broke through the Lion defense for a long run from scrimmage. Issac Edwards notched the extra point for the Cougars. 9-16-18 Rocky Hill/New Hartford Game results! Scores from week 2 today at New Hartford and Rocky Hill. *New Hartford forfeited the game at halftime. Thanks to Mike Seward for the B Squad VIDEO! Scores from week 1 today at East Hartford. More game information and game photos will be posted on Facebook this week. The teams will be back in action in week 2 next Sunday as the A team travels to New Hartford for an 11am tilt while the B, C and D teams travel to Rocky Hill for a trio of games at 9am, 11am and 1pm respectively. Video from the B squad game vs. East Hartford (26 HK-12 East Hartford). Thanks Mike Seward! Check out our Facebook page! Either click HERE or click on the "facebook" link on the left, vertical toolbar. Thanks Eric Anderson!